Ciara Mooney, Advanced Nurse Practitioner and lead author of the study on sports injuries said of the findings, “The most prevalent sport for injuries was hurling and camogie with 38% of all presentations followed by soccer with 32%, rugby with 15%, Gaelic football with 10% and horse-riding with 5%. “In line with other studies, hurling and camogie accounted for a significant per cent of finger or hand related injuries - 50% were finger or thumb injuries and a further 23% were hand injuries. The largest proportion of soccer injuries were ankle (37%) and knee (16%) injuries. Rugby presentations were an equal number of lower limb and head injuries. 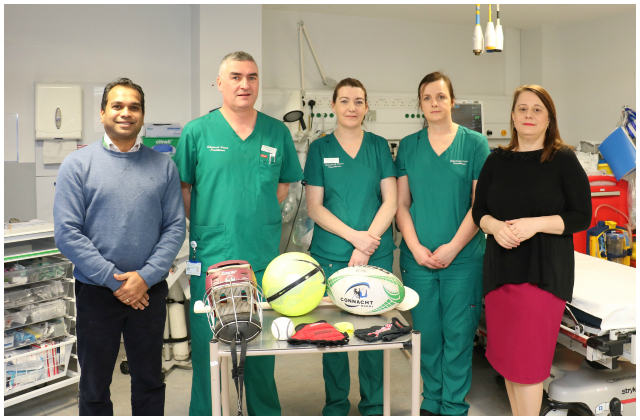 Emergency Department staff at Portiuncula University Hospital involved in the study of sporting injuries, from left: Dr Kiren Govender, Consultant in Emergency Medicine; Advanced Nurse Practitioners Aidan Fallon, Enda Jennings and Ciara Mooney; Dr Laura Bandut, Consultant in Emergency Medicine.